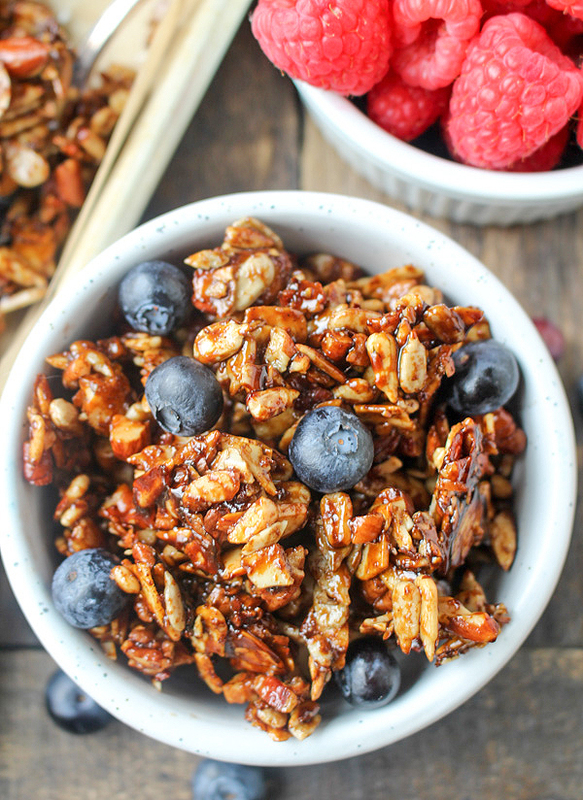 This Paleo Gingerbread Granola is sweet, perfectly spiced, and easy to make! 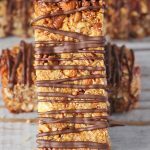 A delicious snack or breakfast that is gluten free, dairy free, and vegan. 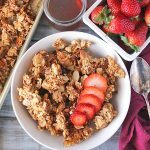 Gingerbread granola- I know that seems like a fall/winter flavor, but I think it’s too good to only enjoy for a couple months. 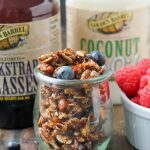 This granola is coconut free because I know there are people out there that don’t like coconut. 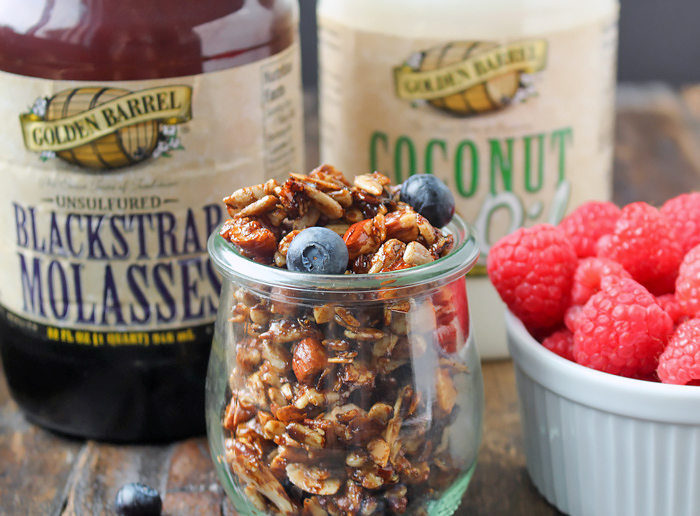 I love coconut- especially in granola, but this one is good without it. It’s packed with nuts and seeds and of course the gingerbread spices- cinnamon, nutmeg, allspice, and ginger. 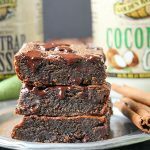 It’s sweetened with maple syrup and blackstrap molasses– which is the perfect combination! I love how those two pair together and add so much flavor! 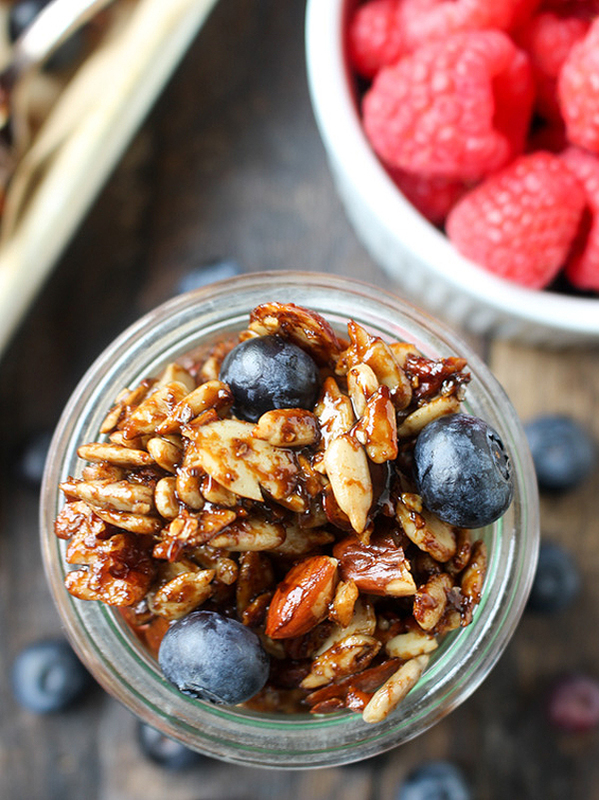 This granola is super easy to make! 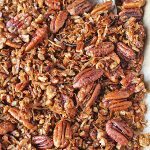 Chopping the almonds and pecans is a little time consuming, but that can be done with a food processor if you like- just don’t over process them into tiny pieces. Once those are chopped, everything is just mixed in one big bowl and mixed. One important tip is to use parchment paper on the sheet tray. The mixture gets a little sticky and is so much easier to stir and remove if parchment paper is used. The cooking time on this granola is a little longer than my other granolas. The first time I made it the flavor was perfect, but it was a little too sticky. It needed more nuts and more baking time. The second time I baked it longer, stirring every 10-15 minutes, and it came out perfect! Crunchy, evenly coated, and so delicious! This makes the perfect snack just by itself or you can pour it in a bowl and add some almond milk for breakfast. Although I didn’t add any, chocolate chips would be delicious stirred in once it’s cooled. 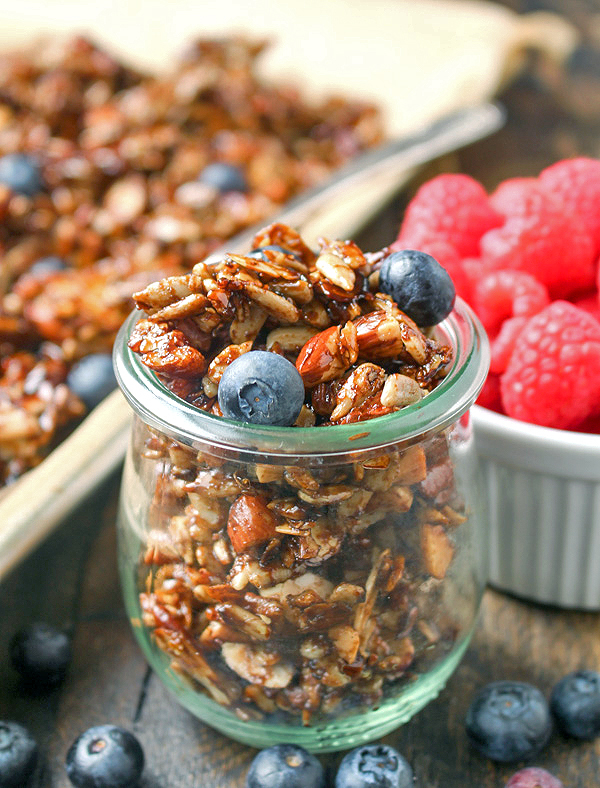 Here are some more paleo granola recipes you may love: Paleo Honey Almond Granola and Paleo Pecan Pie Granola. Preheat oven to 300° and line a sheet tray with parchment paper. Don’t skip the parchment paper- it can turn into a sticky mess without it! Set aside. 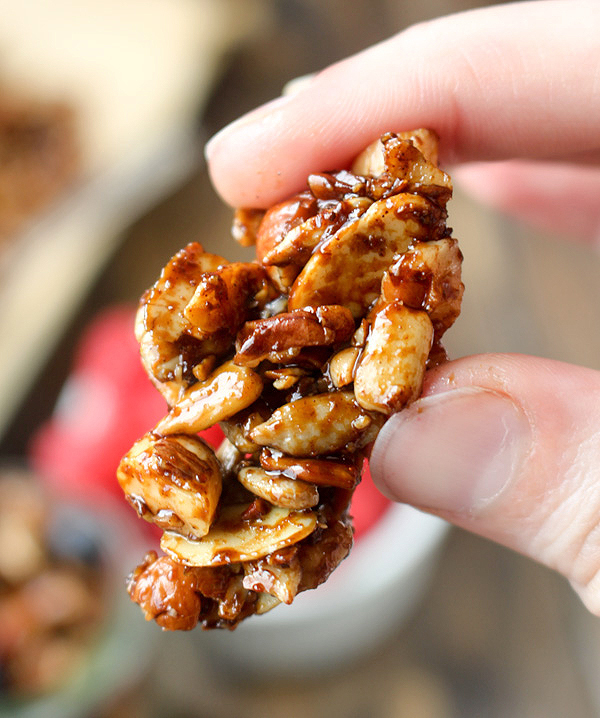 In a large bowl, combine pecans, sliced almonds, sunflower seeds, and chopped almonds. Add in the salt, ginger, cinnamon, nutmeg, and allspice and stir well. Add in the coconut oil, maple syrup, and molasses and mix until everything is evenly coated. Dump onto the sheet tray and spread evenly. 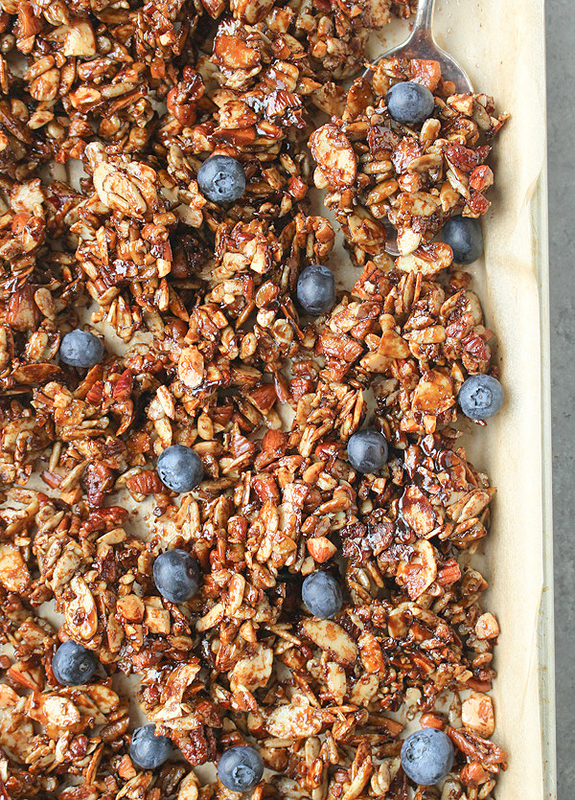 Bake for 20 minutes, remove and stir the granola and cook for 15 more minutes. Remove it again, stir and cook for 10 minutes. Remove it again, stir and cook for 10 minutes. Remove for the last time and let fully cool. If you want clusters than don’t stir it while it’s cooling, press it together while it’s still warm. Can you make this without so much sugar but that it still holds together? Trying to reduce sugar intake to burn fat. Hi Debbie- yes, I definitely think that will work. Maybe 3 tablespoons of maple syrup. Hope you enjoy!